Buddy Valastro, the star of TLC’s smash hit Cake Boss shares everything a home cook needs to know about baking as he takes readers through the same progressive training he had in his own apprenticeship. Call it the Buddy system, because Baking with the Cake Boss is an education in the art of baking and decorating, from kneading to rolling, fondant to flowers, taught by Buddy Valastro himself, the star of TLC’s smash hit Cake Boss. With more than 100 of his most sought-after recipes, including birthday and holiday cakes and other special theme designs, this book is a master course that culminates in the showstopping cakes for which Carlo’s Bake Shop is famous. 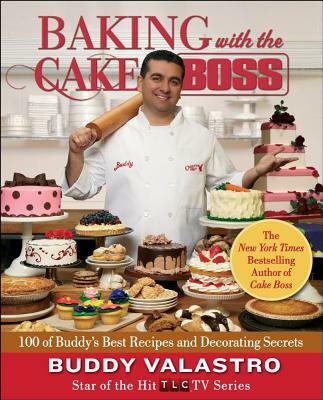 Following the arc of Buddy’s career from apprentice to master baker, Baking with the Cake Boss offers readers the same on-the-job education earned by everyone who comes to work at Carlo’s Bake Shop, with some of Buddy’s and the family’s memories shared along the way. It builds organically from simple cookies and pastries to pies, flower-adorned cupcakes, and basic fondant cakes, to breathtaking cakes for every holiday and special occasion. And, as you progress from basics to bedazzlements—like the safari cake complete with chocolate animals and a waterfall—Buddy shares his inspiring enthusiasm and stories from the shop in his inimitable voice. He also provides the tools for creating your own personal trademark cakes, with a chart that lets you mix and match cake, frosting, and liqueur syrup for cakes the way you like them. And there are plenty of photos that illustrate artistic flourishes and decorations you can use to adorn your individual creations. With 650 gorgeous, step-by-step instructional photos that let you follow Buddy as if you were next to him in the bakery, Baking with the Cake Boss is an incomparable dessert education that will become an essential reference for aspiring and skilled bakers alike. Bursting with delicious, tried-and-true recipes, how-to boxes and sidebars, and numerous tricks of the trade, Baking with the Cake Boss is a rare treat—a fun, accessible guide to baking, all in a gloriously designed, fully illustrated package worthy of the Cake Boss’s artistic vision.